« Why are these Dutch-style houses on 37th Street? The fire started at 4:40 p.m. 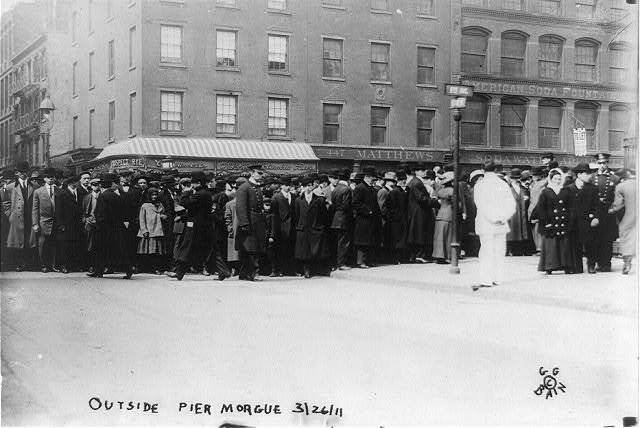 It was Saturday, March 25—a workday in 1911. As flames quickly turned the top three floors of the Asch Building at Greene Street and Washington Place into a “roaring cornice of flames,” dozens of employees crowded the windows and fire escapes. 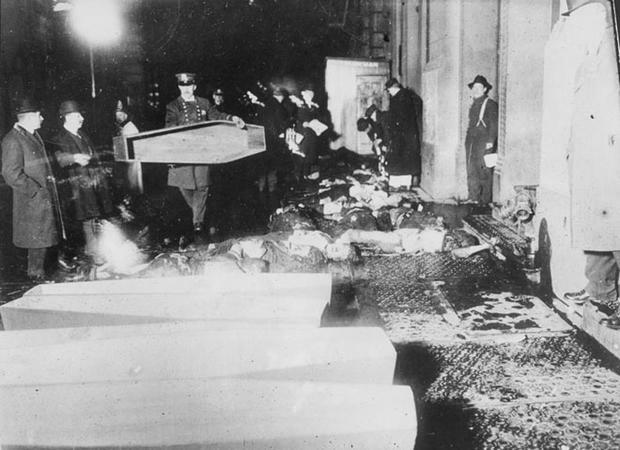 Half an hour later, when the fire had been extinguished, 146 Triangle Waist Company workers were dead, many burned beyond recognition. The grim task of identifying so many victims had begun. 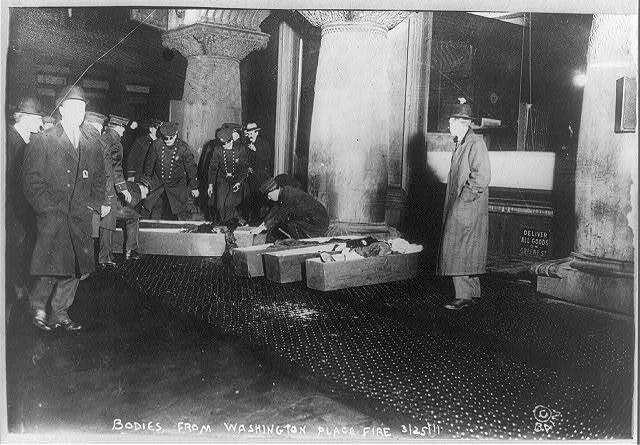 Over the next several hours, their corpses were laid out on the sidewalk, tagged, put in coffins, and loaded into wagons. 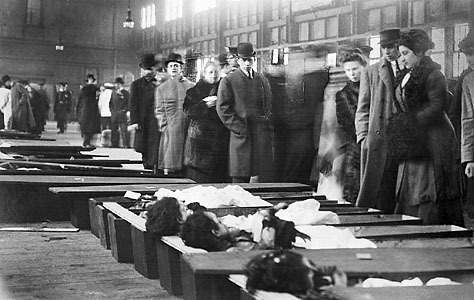 They were going to Charities Pier, off East 26th Street—nicknamed “Misery Lane” because it was the makeshift morgue where city officials routinely brought victims of lethal disasters. “When the wagons arrived, they were met by a team of homeless men dragooned from the Municipal Lodging House, who were assigned to open the boxes and arrange them in two long rows,” wrote David Von Drehle in Triangle: The Fire That Changed America. “At midnight, the doors opened. The first in a growing line of friends and family members began shuffling up one long row and down the other. Low voices, slow footsteps, the cry of gulls, and the lapping of water punctuated the heavy silence. “A faint sulfuric glow fell from the lights hung high in the rafters. They did little to illuminate the coffins, however, so policemen stood every few feet holding lanterns. “When a loved one paused at a box and peered close, the nearest officer dangled his lantern helpfully. The task of identifying the dead lasted four cold, rainy days. Pickpockets and the morbidly fascinated lined up along with family members. Within a week, all but seven bodies had been ID’d. 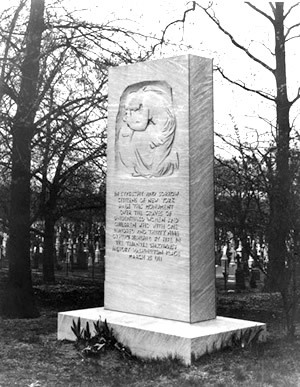 In April, they were honored in a procession (above) and buried together at the Evergreens Cemetery in Brooklyn. This entry was posted on March 22, 2014 at 7:13 am and is filed under Cemeteries, Disasters and crimes, Gramercy/Murray Hill, West Village. You can follow any responses to this entry through the RSS 2.0 feed. You can leave a response, or trackback from your own site. The thing is, the owners of the Triangle shirtwaist company got off with little more than a slap on the wrist, and they opened up a new factory soon after uptown and did the SAME things they did here- locking the exit doors! Although the (crimminal) factory owners got off lightly, this was the catalyst for a movement toward safer working conditions. I find the descriptions of the tragedy haunting and mesmerizing. Some accounts describe the “thud, thud, thud” of human bodies hitting the pavement….eerily repeated at WTC on 9/11. Yes, the descriptions are terrifying. A large crowd watched as the mostly young female workers were forced to jump from the ninth floor; many witnesses said the sound of their bodies hitting the pavement was the worst thing they’d ever heard. Yes the owners walked away free of murder charges. More than 100 years later Albany is still filled with purchased legislators and judicial officials. Sad really. In the late 1960s nearly 60 years after these ghastly events a similar tragedy took place in James Watt St, Glasgow, Scotland. The young girls found themselves with no way to escape. The windows had bars on them. The firemen were literally feet away and couldn’t help them. 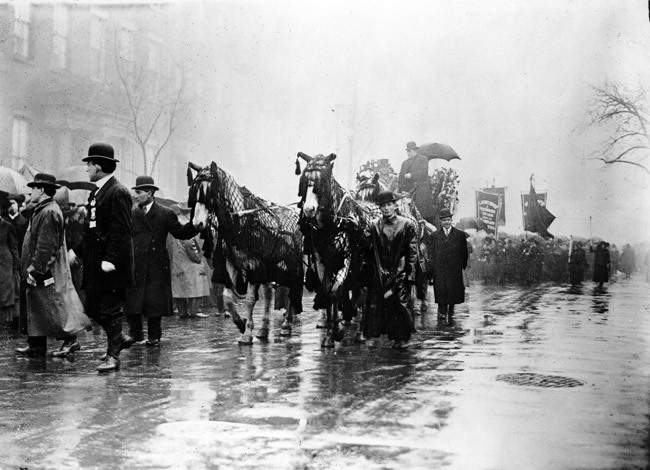 The photo of the rainy day procession was taken on Washington Square North/Waverly Place. For several years, I attended the extremely moving memorial ceremony held at the Triangle Building on Greene St./Washington Place, especially poignant when a fire dept. ladder was raised to the highest floor it reached on that infamous day.